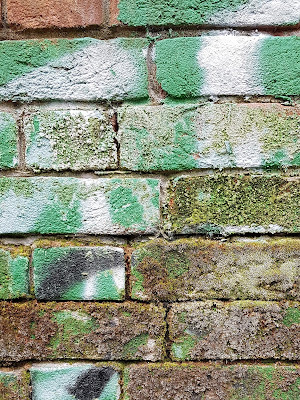 oxford canal mural project, sunny days-chilly evenings, where are the bees? One of the highlights of my Oxford canal walk is the Oxford Canal Mural Project. 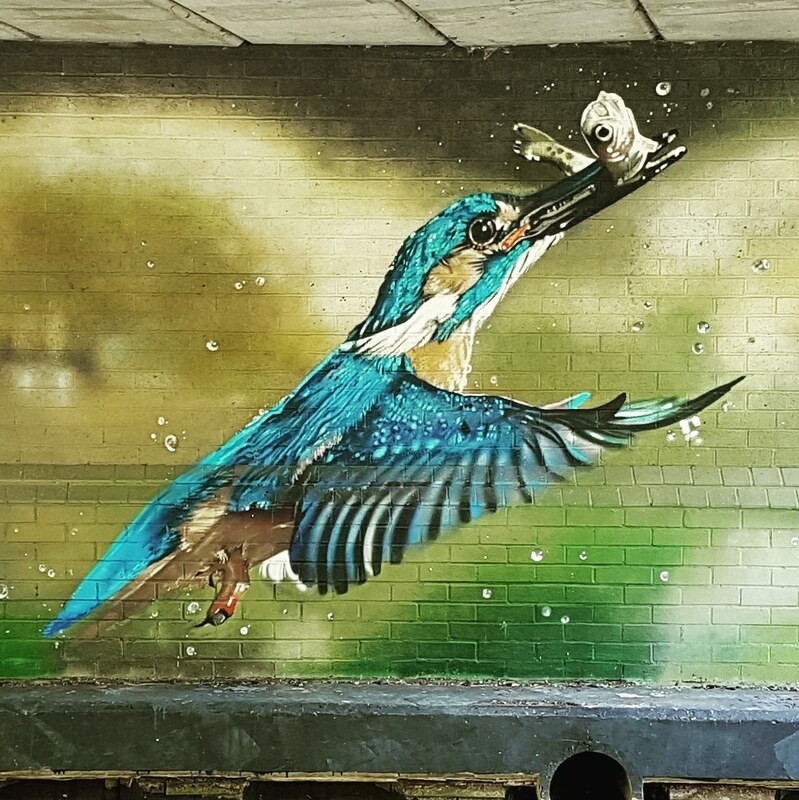 Perhaps the most striking work is Richard Wilson's kingfisher under the bridge near the Trap Grounds. Though all the murals are a joy to see. Loving the sunny weather. Great to sit at the top of the garden at sunset - despite the chilly evenings. What isn't so great is the almost total absence of bees this summer. With shrubs like the weigela in bloom and aquilegia flowering, I would have expected the garden to be buzzing but there's hardly anything. As the Berks, Bucks & Oxon Wildlife Trust says, 'Heavy use of toxic sprays on flowers, intensive agriculture and a reduction in the number of insect pollinated crops has brought about a huge drop in bee populations. Urbanisation and loss of habitat have hit bees hard. Indeed some wild bee species are close to extinction. Never more so than now, bees need your support.' But, can this sudden absence be explained by sprays or was the hard winter to blame? Will numbers increase? If so when? The garden soundscape without bees is so unnerving. What an amazing bank holiday weekend! So hot and sunny! Wasn't able to get to the allotment till Monday afternoon because I had office work to do but we had some lovely late lunches at the top of the garden by the frog pond. Went to the allotment today to catch up. No sign of the spuds yet, although the shallots and onions are doing well. Last year's chard has come back. Should be picking some tomorrow. Have been rediscovering the old Wolvercote Green-Oxford Canal-Jericho walk I used to do before the 18 bus route was axed. Having enough time to do this walk before work is dependent on traffic on the A40, which is why I've not done it for ages. There used to be long queues but I'd heard rumours that things were better, so, knowing that the mud on the towpath would have dried out by now, I decided to catch the S2 from Witney rather than the S1 and see what happened, Wednesday and Friday. Plenty of time! (I think also that in part I may have avoided doing the walk because it seemed so sad that the 18 had been cut...) The photo shows graffiti and lichen on a wall beside the Oxford canal near Jericho. Very much enjoyed showing Dilma Rousseff, president of Brazil, 2011-2016, round the Bodleian Library prior to her lecture at St Antony's on Monday. 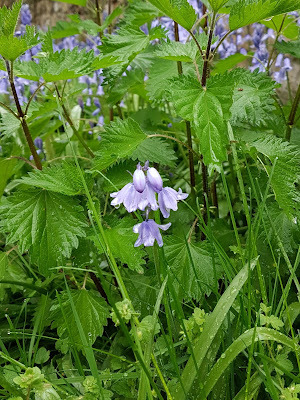 When walking through the churchyard of St Thomas the Martyr in west Oxford last Saturday - I was on way to work (one of my library Saturdays) - I saw bluebells growing amongst nettles. Enough to make one unplug the strimmer's battery charger for good? Possibly. Certainly a case of, Let's hear it for the nettles! A busy start to the term. Without good spring weather to keep up energy levels. Still, the forecast is promising for the bank holiday weekend and I should be getting more spuds planted. The Maris Peer rows went in last weekend and onions and shallots the week before.